This gorgeous glass drawer knob features a unique ten sided style design. 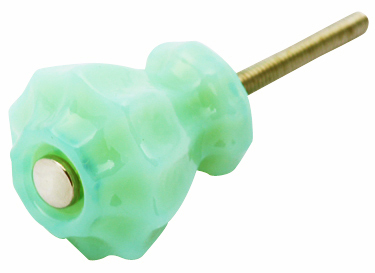 It's made from the finest milk green color silica glass and were individually hand made by professional glassworkers. Measure 1 1/4 inches (32 mm) in diameter (measured from point to point on the hexagonal) and they have a projection of 1 1/4 inches (32 mm). Sold individually and come complete with the Chrome 2 1/2 inch hardware. Brass hardware available.